Most of the dancers in Sambūris are originally from Lithuania, so the name of the festival Čia – mūsų namai (This is our home) held a deep meaning for us, and for our proud family members and friends who came to watch and help us. I am especially grateful to my friends from my Alma mater – Vilnius University and to my old colleagues from the Lithuanian Television station for sharing wonderful photo and video memories. Sambūris dancer Aric LeBlanc, a former student and now a tea cher at the Boston Lithuanian School, was born in the United States. He had visited numerous countries, including Australia and Mexico. “As I wandered across the borders that so many choose to never cross, I was able to gain a better perspective of my own life. Having never visited Lithuania, my trip to the Festival was more intense than any other trip I have taken. Being able to visit the places that I saw in books from childhood, to speak the language where it was born, to consume the food and drink in a real Lithuanian restaurant – there’s really nothing like it. 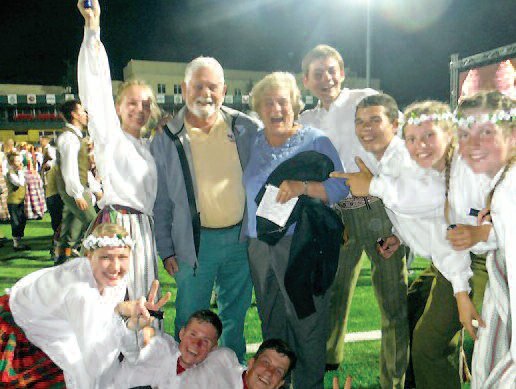 “Dance Festivals always change the way I percieve folk dancing, but this Festival just blew the other two that I’ve participated in right out of the water. The rehersals were a blast – even with the crazy weather changes. The program was very well planned. I had tan lines from being in the sun for 12 hours at a time. “Instead of dancing with the student group, I had an opportunity to dance with the adult group because it was short one dancer. Everyone was welcoming, well-rehearsed and always in a good mood. “I was most surprised at the sheer diversity of people present in Vilnius during these festivities. I met people from Boston, New York, Chicago, Toronto, Argentina, UK, and a variety of other places. Most of them were students, out to party, or young professionals. All were friendly, articulate and unique. “I am so glad to be a part of a community that breaks all distance barriers and comes together and does something incredible and creative in a way that only they can. I hope to continue dancing as long as I can and am seriously looking forward to the next Šventė.” Aric concluded. This was the second visit to Lithuania for Argentinian Aniela Ona Remorini Gasiūnaitė, a dancer with the group “Nemunas” from Berisso, Argentina. “The first time I visited my second home – Lithuania, was in 2010 while attending Lithuanian language studies at the Vasario 16–oji High School in Germany. This July, I had the opportunity and honor to represent Argentina in the Song and Dance Festival along with 8,000 dancers from around the world. It was something I will never forget. It was a gift that life has given me”. Berisso, until the First World War, was one of the biggest Argentinian Lithuanian colonies with over 3000 immigrants. 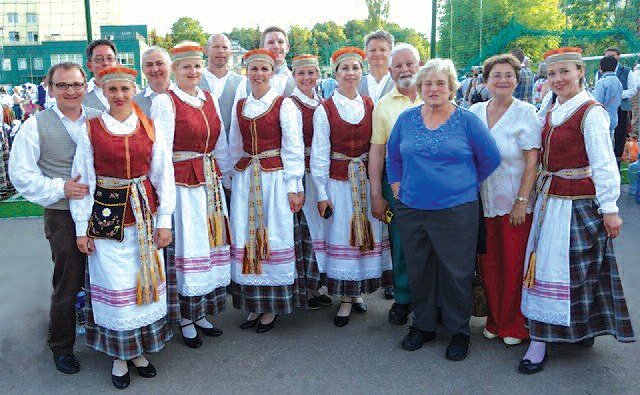 Every September–October Berisso hosts “The Immigrants’ Festival,” which is sponsored by “The Immigrant’s Union.” This organization is comprised of 20 immigrant communities one of which is the Lithuanian organization Nemunas. “Lithuania?”, – a friend asked. “Now, just where is it? I can’t really remember”. “Friends and Music” is Herb’s answer as he continues his explanation. “As members of the Monadnock Chorus in Peterborough, NH, my wife Teri and I sang in a Christmas concert of Lithuanian Music. The gifted soprano Jūrate Švedaitė-Waller from the Connecticut Lyric Opera had joined the chorus a couple of years before, and in conversation with Music Director, Jim Sharrock, helped mold together a program for the Christmas season. The Motleys meet with dancers during the closing ceremonies of the festival. My first encounter with the Motleys was well described by Herb: “Another coincidental happening was a backyard fence encounter with a new neighbor Dalia. “What are you doing up in New Hampshire?” – she asked. “Mostly music,” I replied. “We are preparing a program for a Lithuanian Christmas in December.” “Did you know we are Lithuanian? – she asked, “I am also a member of a Boston dance folk group Sambūris.. So our group, added a dance component to the concert, and Dalia herself helped us plan the concert at St. Peter Lithuanian Church in South Boston in January. “Kristina Vasiliauskaitė had brought us some lovely photo books of Vilnius during her December visit, so we could see a sampling of the wonderful Baroque architecture. The Lonely Planet Guide got our planning minds in motion. It was intriguing as neither my wife nor I had ever visited a former Soviet country before. It was this juxtaposition of Baroque elegance rescued from years of Soviet destruction and neglect which was a recurring theme of our stay. And once we began, there was far more than we could cover in the six days. After 10 hours of rehearsals for the Dance Festival I was finally able to catch up to the Motleys and Kristina after the opening concert at the Cathedral square. There was no better place to welcome our American neighbors in my home town! “The Church of St. Johns in Vilnius (The Baptist and the Apostle) hosted Skambėkite Kanklės concert with about 50 kanklės players and a 50-voice mixed chorus, all in their regional dress for a Friday night concert which featured a composition Ateik, gyvoji siela by our friend Kristina Vasiliauskaitė, who composed the Magnificat, that we sang at the Christmas concert,” – said Herb. “Kristina accompanied us for most of our time in Vilnius, making good use of a Lithuanian-English dictionary and helping to navigate parking regulations and other situations where it was really useful to have someone with us who could explain, negotiate, or protest,” added Teri. 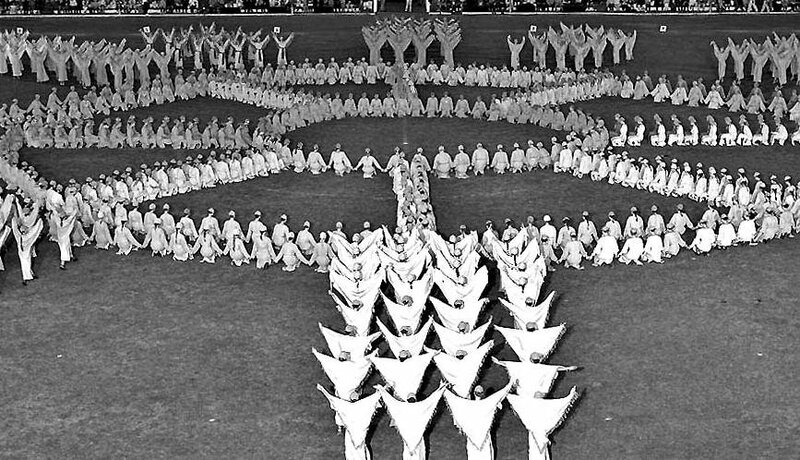 “The next cultural event was a three-hour dance performance Sodauto in a soccer stadium by 8,000 men, women, and children. 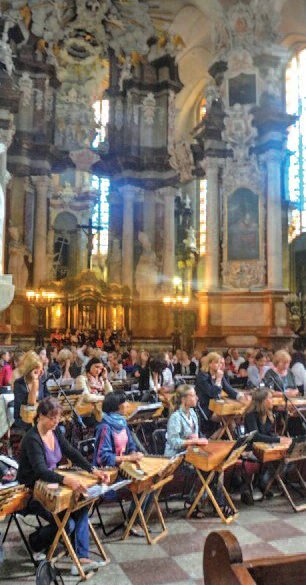 One of them was our friend Dalia Shilas, with the Boston group Sambūris. We sat in the stands with mostly people from the Lithuanian diaspora, who were surprised that we were there without having any connection, other than music and friendship, with Lithuania. 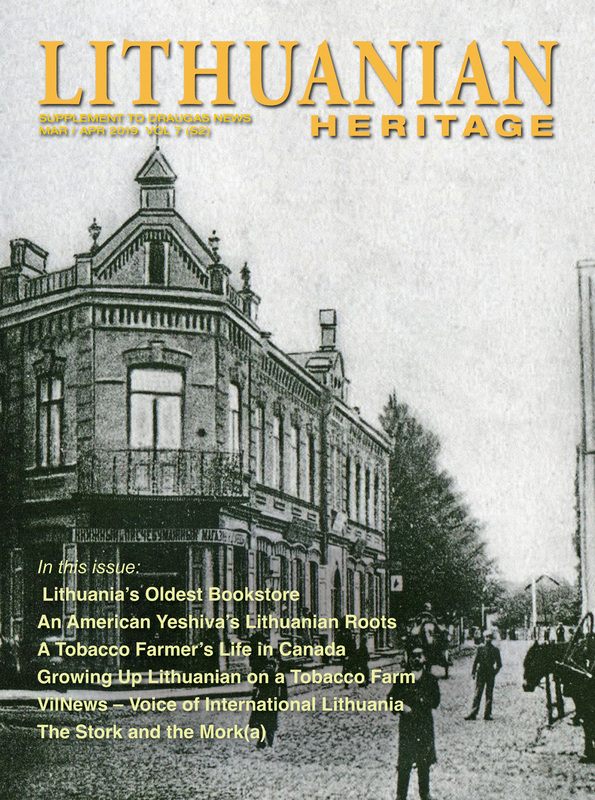 We learned that news of our Monadnock Chorus Lithuanian concert had been shared throughout the Lithuanian diaspora. The couple next to us in line, who were from Cleveland, knew about our concert. “Each pattern on the field involved as many as 1000 dancers in various positions across the field. As these intricate figures played out in front of us, we noticed an equal number of dancers lined up in the end zone ready to take the field at a moment’s notice. The finale brought all 8,000 dancers out onto the field filling it completely with only standing room for each participant,” described Herb. Teri and Herb did not see Sunday’s Parade to Vingio parkas or the Finale concert there. “Baisogala is a small hamlet two hours’ drive north of Vilnius and the location of a 1905 rural estate which since Soviet times has been an agricultural institute. The magnificent central house features a circular domed concert hall where our friend Jūratė Švedaitė-Waller gave a concert for the local community that Sunday afternoon. She was joined by a baritone partner and an excellent accompanist. Far from the folk style of the earlier music of the weekend, Jūratė and friends chose selections from opera and musical theatre. Overpowering! 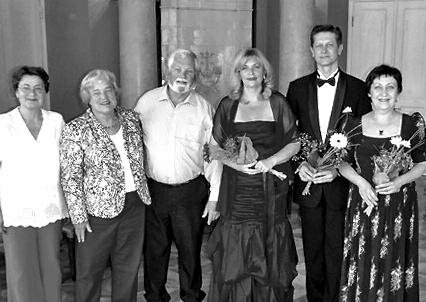 “It was such a treat and honor to see them, all the way from New Hampshire, USA and the composer Kristina Vasiliauskaitė in the audience in remote Baisogala. The venue itself is quite known to Lithuanian public – a beautiful old estate that has a big ballroom with a balcony, that was transformed into a perfect chamber performance space. I was joined by my colleagues: Associate Professor at the Lithuanian Music and Theater Academy baritone Dainius Puišys and pianist, also Associate Professor at the Lithuanian Music and Theater Academy, Audronė Kisieliūtė. 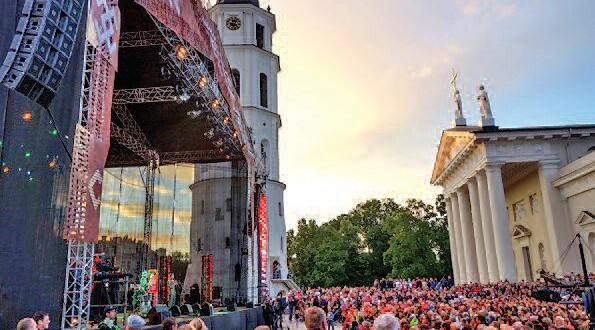 The concert itself took place on July 6th – the Coronation day or the Lithuanian State Day – the equivalent of the American 4th of July. We presented a varied program of operatic pieces, art songs and Broadway numbers. That same concert we presented at Kaunas National Philharmonic a week later. Audronė Kisieliūtė will be joining me this coming March for a number of concerts in Connecticut and Florida. 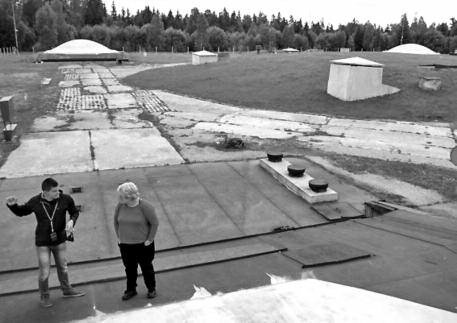 “Did you know that one of the National Parks in Northwest Lithuania contained an underground missile base?” Herb asked. “It was discovered after the Soviet withdrawal in 1991! Sure, the local farmers knew some big secret project was there, but the general public apparently did not. It has since been turned into the Cold War Museum and open for public tours. 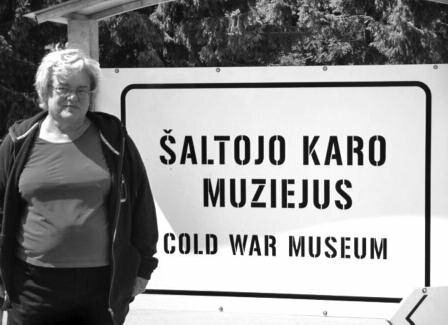 Teri at the Cold War Museum. “After some back and forth opinions, we decided to rent a car for the 3-hour trip. Driving was easy and the roads were far better than “third world New Hampshire.” The car worked fine, but there was some confusion in getting it delivered to us in town and even more trying to find where to drop it off at the airport on our way home! We did make a mistake of using a debit card to pay for it, as that carried no insurance like a regular credit card. “The Cold War Museum is set up in the underground control bunkers of the former missile base. The base was built in secret during 1968 by imported laborers and includes four deep missile silos stretching 25 meters down into the earth covered by a bomb proof cement cover. Things change fast in the defense world and by 1978 the installation was deemed obsolete and simply abandoned by the Soviets after removal of the missiles––the big ones we saw on trailers pulled through Red Square in the news coverage of May Day parades for so many years. “Most things of value or potential salvage were stolen from the base over the years until recently when the museum was funded by the European Union. The visitor is treated to a combination of remnants of the original control installation with a very balanced history of the Cold War showing rhetorical excess from both sides. Best coverage is the filmand news of the Cuban Missile Crisis. From the depth of the bunker, it is very easy to feel the precipitous times which were the closest the two super powers came to a shooting/bombing war during the Cold War. (English language headsets are provided to supplement the guide’s narrative.) Our guide was a very personable music student with a remarkable grasp of realpolitik. “On our return trip we stopped at Kaunas, the second city of the country. Another charming old town near the river. The central streets are closed to automobiles and filled with thronging celebrants of the long summer days. The anachronistic sounds of rock bands echoed around another baroque square filled with young people. Since Kaunas was the capital of the country for short periods in the past, it is more ethnically pure Lithuanian in its population compared to the very cosmopolitan mix of Vilnius. Kids growing up in Soviet Vilnius learned Russian from other kids whose parents had been imported by the government. Their counterparts in Kaunas didn’t have such exposure to the outside world. 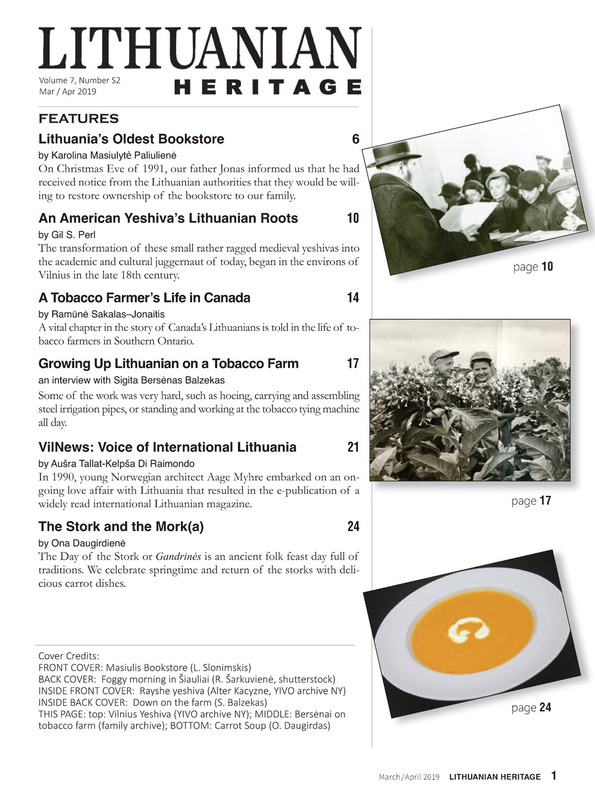 “Lithuania lives still in the shadow of Soviet occupation. Now, more than 20 years from the 1991 liberation and reestablishment of independence, many buildings converted to alternative use in the Soviet era have been restored to a semblance of their former selves. In our two motor trips out of the capital we passed through miles of flat open cultivated fields. It was very easy to understand how migrating armies from Napoleon to the Nazis to Russians could sweep across the plains at the greatest speedpossible for each era. Earlier, in the 17th century, Lithuania herself was a great power in conjunction with Sweden and Poland governing south, almost to the Crimea. “Another grim monument to the “evil empire” is the Museum of victims in the former KGB headquarters. Today each stone block on the exterior wall is engraved with the name of a victim to the Soviet Regime. Ironically, it is located right next door to the Academy of Music where we met up with Jūratė for lunch,” remembers Herb. “With the two trips outside of Vilnius,” – added Teri. “We saw a lot of the country, which is mostly beautiful, rolling fields punctuated by blocks of forest. The cities are full of beautiful churches, most of which have had to be restored after 46 years of determined Soviet desecration. Lithuania has suffered terribly under Russian and German occupations, which tried to erase their cultural identity. Hundreds of thousands of people were killed by the occupiers, but though there are museums and monuments honoring the victims and resistance fighters, most Lithuanians look forward, not back. 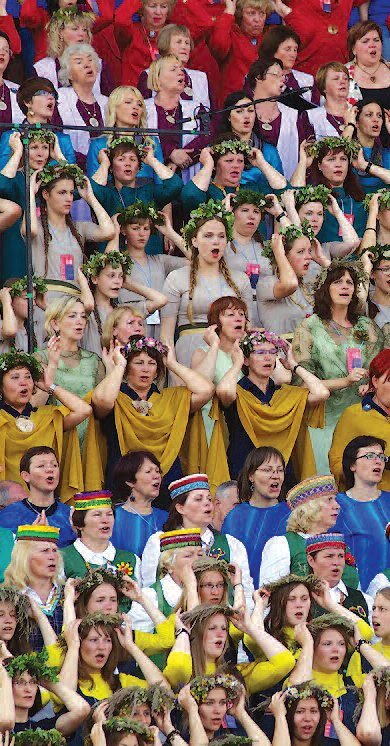 Against this background, the regional dress and the shared music look less quaint and more like a courageous affirmation of Lithuanian uniqueness. “Go! You will be enriched and amazed,” Herb finishes their story of their visit.
? ? ? My own visit to Lithuania continued with my son. He was able to improve his Lithuanian language skills, and saw numerous Lithuanian historic places, and experienced local traditions and food. 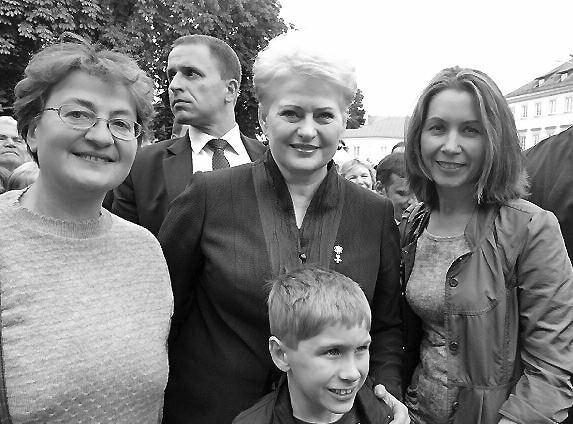 We also met with many interesting people, from local farmers to the president of Lithuania. As we joined Kristina at the President’s Inaugural concert site, my son was all excited about being so close. “Hi, President, I am from Boston,” he exclaimed. As she turned toward us, the crowd cheered and someone took our photograph, a special memory to share with family and friends. It was a beautiful July for us.